Cushioning and a wide variety of rod end fittings. Laystalls' Hydraulic Component facility manufactures a wide range of products such as caps, pistons, valve/port blocks and trunnions required for in house cylinder assembly. These products along with rods and tubes can be supplied to the Customer for self-assembly if required. A displacement cylinder operates by displacing the cylinder rod and consequently has gland seals but no piston or piston seal. The force developed acts on the outward stroke only and the cylinder relies on the load or some other force to return the cylinder. Similar to a displacement cylinder but this cylinder has a piston seal but no rod seal as oil is only input to one side of the piston. This has the advantage of generating a larger force for the same diameter cylinder compared with a displacement cylinder. The force developed acts on the outward stroke only and the cylinder relies on the load or some other force to return the cylinder. However the annulus side of the cylinder has to be vented to atmosphere and as a consequence this can generate noise when the cylinder moves. Venting the annulus to atmosphere can also permit corrosion of the tube bore and the chromed rod. Only a single pipe is required to feed the cylinder. A double acting cylinder applies pressure in both directions to the piston in and out. 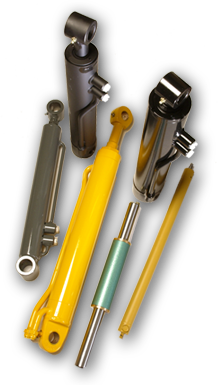 These cylinders have a single rod with a centrally placed piston and the rod protruding from both ends of the tube - The cylinder can generate a force in either direction and these are commonly used as a steer cylinder. Usually used in lift applications this type of multi stage cylinder relies on the load to return it and acts in one direction only. Due to the design of the internal oil ways within the cylinder all of the rods move out at the same time resulting in a smooth single speed motion of the load and the force applied by the cylinder is constant throughout its' stroke. This type of cylinder is multi-stage and can be single acting, displacement, double acting or a combination of these options. The outer rods are tubular and more than one rod is placed one inside the other. This has the advantage of giving an increased cylinder stroke for the same length of cylinder. The force available is proportional to the area of the rod or piston being displaced and as a consequence the force reduces as each rod is displaced in turn. Conversely the speed of the cylinder stroke increases as each rod is displaced in turn.